The future of the smartwatch, according to kids #Wearables « Adafruit Industries – Makers, hackers, artists, designers and engineers! 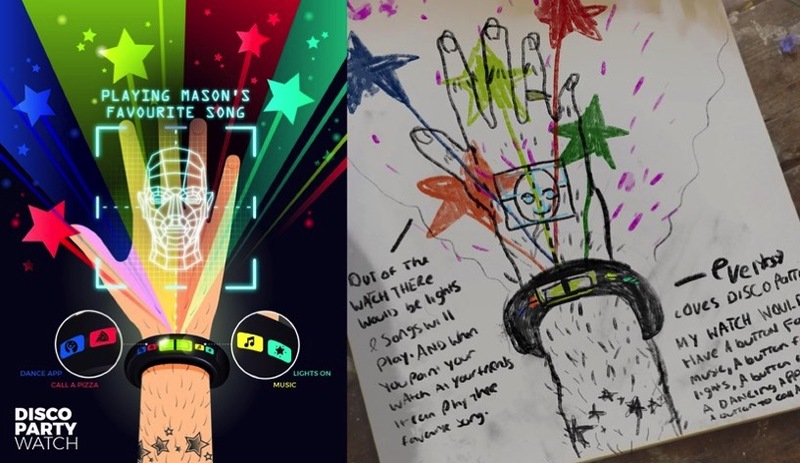 We asked kids across Britain to imagine a smartwatch of the future. From holograms to mood sensors and even time-travel, our young artists set their imaginations free and blew us away with their ideas. Fifty years ago, who would have imagined all the things a watch could do today. More than just a portable way of telling the time (and a stylish accessory to boot), with a swipe of a finger it can connect you to your friends, your photos, your music collection…even to your own heartbeat. So, we asked ourselves: given another fifty years of technological progress, what might our smartwatches be capable of? Instead of researching what’s being planned for the next-generation of smartwatches or peering into a crystal ball, hoping for a glimpse of our horological destiny, we asked the actual next generation what they thought the future might hold. And boy, does the future look exciting. There’s a button to trigger the lights, a fully-fledged dancing app and an option to – get this – call for pizza. No matter where we are in the far-flung future, there’s no turning away from delicious pizza.